Whispers in the Loggia: "The Source of the Sacramental Life"
One lesson I've learned through this year is that if you keep your mind open to everything, you'll learn something new every day. It's a lesson I'm mighty grateful for; I know I've needed it and hopefully it'll never leave my side. There's also a blurb about the visit and all its liturgical stages. And one thing really caught my eye. At his entrance (as pictured, the cappa magna was the star of the show), Burke and his attendants prayed before the Blessed Sacrament, reserved on a side altar. I couldn't help but ask myself, "Side altar? Old rite? Am I missing something here?" The Blessed Sacrament is removed from the high altar when a bishop celebrates Mass, as the Ordinary [Diocesan] Bishop is the source of the sacramental life of his diocese. 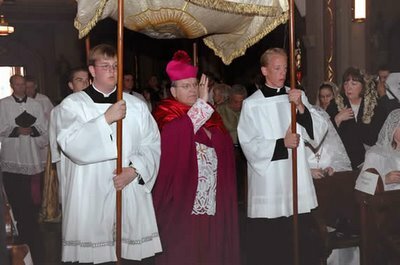 I was very intrigued to see this, as I had never seen anything of the kind before -- not the principle, but the removal of the Hosts to a side altar in the old rite as a means of deference to it. It's mighty impressive -- especially in light of the people in LA who'd sooner hang themselves than acknowledge and respect their diocesan bishop as the "source of the sacramental life" there. Then again, friends, this is the nature of a hierarchical church. Even the Tridentine ecclesiology acknowledges this. Bottom line: No excuses. Like it or lump it.